As I was preparing to replace my Spark Pugs and Coil packs (read the article here) to deal with a Lumpy Idle issue with my DB9 (read this other article here) I was researching the Coil Packs to learn if I could find a cheaper source for them. Many of the parts in a DB9 are not bespoke, and rather scavenged from the massive Ford conglomerate parts bin. Google searching this I came across several forum articles from like-minded individuals on the same search. Some suggested that Coil Packs were the same as a Lincoln LS 3.0l V6 or a Jaguar S Type(both part of the Ford universe back in 2002-2005). In either case, there was no certainty. 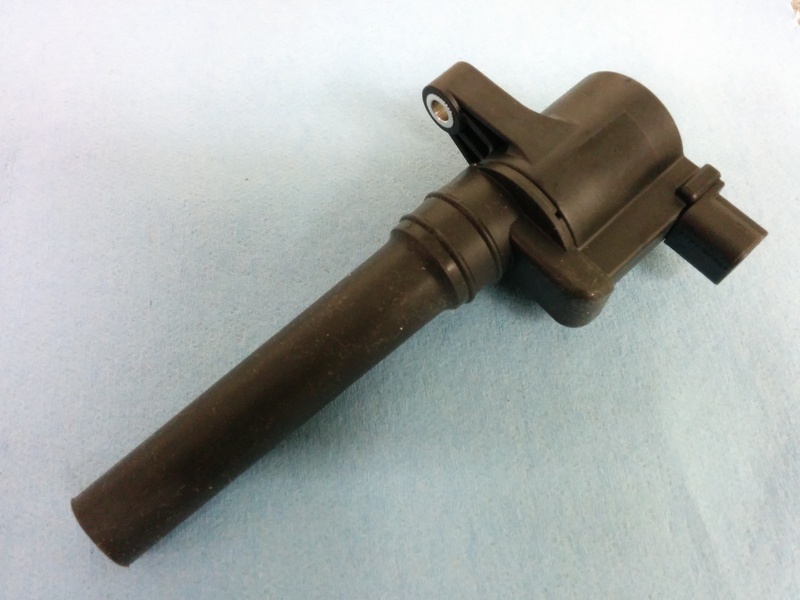 In fact, they acknowledged that the electronics were likely the same, but the ‘Boots’ that inserted into the cylinder head and internal springs connecting to the Spark Plugs were different, but you could just move the boot and spring from your old one to the new. I was not convinced. On top of this, there are two generations of Coil Packs for the DB9. Early cars (MY 04 through sometime mid MY05) had 2-pin Coil Packs, and the MY06 and later cars had 3-pin (referring to the number of electrical connectors). I have not found any clear reference to the cutover VIN number in 2005 yet. I never found an alternate source (either a cheaper aftermarket Coil Pack made specifically for the DB9) or the exact same part sold for another car for less (the Lincoln/Jag may have been similar, but not the same). I gave up and got the Official Aston Martin part number 4G4E-12A366-AA. You can find them online for $66 USD each here, and I paid about £39 ($51 USD) each by contacting Rob Sims at HWM in England. (see my article on Parts Needed to Change your Coil Packs for more details). After I changed mine out, I decided to disassemble the old one to see if the boots/springs were easily interchangeable, and maybe this would help others find a cheaper alternative. Below are photos and a video showing the disassembly and the result. 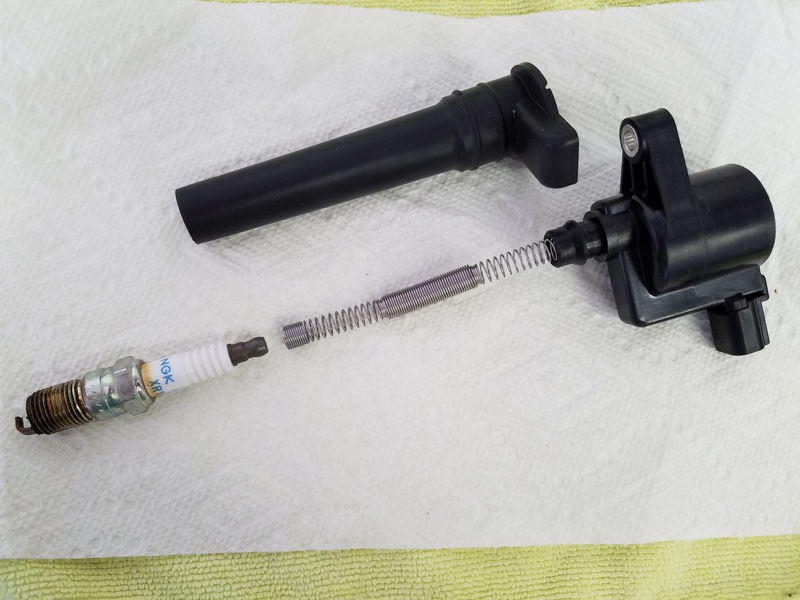 You can remove the rubber boot from the coil pack, and this leaves a wound coil spring exposed that carries the electrical charge to the Spark Plug connection. This spring adds some adjustability to the system. The spring is NOT removable from the electronics head of the Coil Pack as far as I could tell. I futzed with it significantly to try and get it disconnected, but no luck. This would be an essential step if you were trying to reuse this portion of the old Coil Packs and marry them to a new electronics head. If you know how to do this without cracking the whole unit open, please share the process with me. The spring is specially wound (see the photo) and includes a special area that contains a solid metal ‘core’ that has been inserted. This must play some important role in dampening electrical noise or assisting in transmission of the electrical charge from the Coil to the Spark Plug. 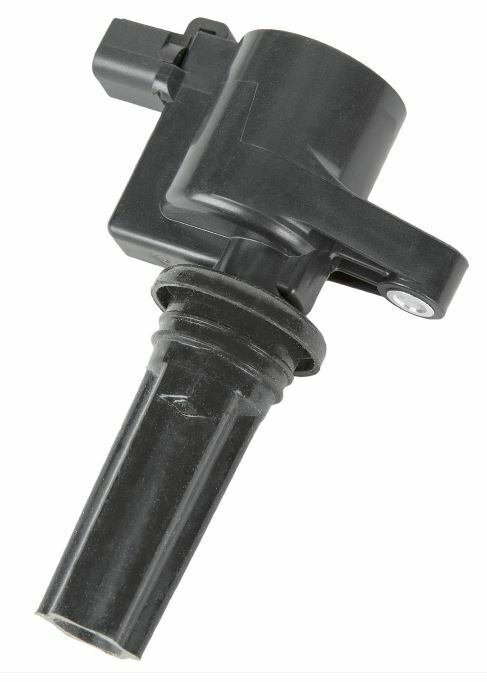 Since the spring/core section is not removable, it seems that if you only interchanged the rubber boot to an alternate part from a Lincoln (that has a shorter stubby body) and maybe just ‘stretched’ the Lincolns spring to reach the same length, you’d not have the solid core or same spring setup. This would worry me greatly that it may affect the performance of the unit in some unanticipated manner – and is not worth saving maybe $20 bucks. It is SOOOOO hard to get in and change these rascals if you do have an issue, the savings would be false economy. So for now, I don’t know of a better solution. I am very interested to hear your input on this if you’ve got a better solution, or if I missed some detail here. I would love to find an alternate source for this part that was half the price and as good or better. Check out my video of the disassembly process here, and below are a series of High Resolution photos that might help you in this quest. Here are some high resolution photos if you are interested in seeing the details close up. Enjoy! How does the length of your Dipstick Measure Up? When using the OBD that you recommend, will you only get readings for misfires for one side of the motor? You mentioned how it only reads 6 cylinders, so dose it only register misfired for the side it test? Or will the misfire code be for all 12? Is there a way to switch it so it can read the other side as well? When you are reading the misfire codes, it shows you all 12 of those at once numbered 1 through 12. Check out the article on this at https://aston1936.com/2016/07/22/lumpy-idle-misfire-on-an-aston-martin-db9/ as it notes to reset the counters and then review the live On Board Monitor Test data. It’s probably worth a quick video to show how to check this specifically, will try to get to it…. Your blog has been a big help. I ordered a wheel from the supplier you mention. They gave me a discount and the part was shipped to Iowa in two days! I am thinking about doing the coil plug job myself. When I inquired about the parts they wanted to know how many pins the could have. I see that you rolled the dice and ordered two pin. I have an 06 DB9 volante. With 22k no misfire codes have ever appeared but I do have a lumpy idle. I am worried about the catalytic converters getting damaged, it doesn’t backfire either. Enjoy Japan. Looks like you be able to at least get to go for a ride in one while there. Hi Steve, Really great website. I have the same 2005 DB9 Aston Martin as you. Mine is also merlot but with single tone beige interior. It has 17,500 miles on it and I am experiencing the same lumpy idle. I purchased the MaxiDiag Elite reader and followed along with your DIY video on how to check for the misfires. Unfortunately I am getting zero misfire readings on all cylinders. I also purchased the Foxwell NT510 reader and it is telling me that the misfire monitor is not supported after installing the Aston Martin program on the reader. The lumpy idle becomes more apparent when it is in gear and at a stop light. Mine goes almost exactly at the same pattern as your did in the video. Before ordering parts and starting on this project I would really like to see the data telling me there is in fact a misfire and in which cylinders. Do you have any suggestions on what I should do? Thanks for any help you might have. I would suggest if you know that you will be keeping the car long term (i.e. 3+ years) I would collect as much compatible hardware as possible as chances are when you needed the price will have gone up and with little aftermarket support for our cars its good to have parts on hand when the issues arise. With that said I understand that your lumpy idol doesn’t read any misfire codes. I would also suggest checking the exhaust pipe to see if there is scoring from a potential leak. I have taken the liberty of collecting consumable parts I may need for later to include spare set of coil packs spark plugs (which can be purchased aftermarket) exhaust pipe gaskets, valve cover gaskets, spark plug O rings just to name a few. Typically there should be ford compatible but matching the part to the number is the treasure hunt. The AM engine management is Ford based, surprise surprise. Ford does not have a live missfire monitor on any diagnostic device. You need something capable of getting into generic OBD II Mode 6. Ford hides the misfire monitor here. Look for PIDs from 1-12 and you’ll see misfire counts on one or more that will show you the trouble cylinders. Any more than a couple counts indicates a misfire on that cylinder. Ford has a pretty crude misfire detection system and it takes a lot to set a CEL. For what it’s worth you are exactly describing the issue my ‘05 has at 20,000 miles when I purchased it 2 years ago. Could and plugs fixed the issue. Glad you are enjoying your car! Hi, Steve. I began my coil pack project today – the disassembly phase. I have a 2006 Volante built in late 2005, so I wanted to see the coils before I ordered replacements. In case anyone cares, engine number AM04/14958 uses the THREE pin coils. I’ve emailed Rob at HWM for his best price on the coil packs, plugs, and gaskets. It took about 3.5 hours to get to the point of having removed the plug covers and one coil and plug (I’m leaving the others in place until the replacement parts arrive). I just want you to know that your nomination for sainthood is moving along nicely, and you can expect to be hearing from the Vatican any day now. I cannot imagine the terror of doing this job without your guidance. You have made it pretty much idiot-proof. Thank you so much. May I ask where you can locate the motor number? Hi Mike. Looking forward to a call from Pope Frank, he seems like a cool guy to meet! Glad the articles helped, and that you nailed down you needed 3 pin coils before you ordered. 3.5 hours is a good pace, you might get hired by AM! Good luck with the rest of the project…. Where were you able to locate the engin number? Steve showed me where his is but it’s seems they may have relocated it on the 2006 model. I also have a 2006 and and am about to do the job. I really appreciate the excellent advice provided. My car is a 2007 DB9 coupe with sports pack and 28000 miles. I have been researching changing the auto transmission oil. ZF say change after 8 years or 50,000 miles which I think should be the definitive answer. There is a good educational video from ZF on you tube. I’m not sure how easily the fill plug is to access on a DB9. Your opinion would be helpful. Great idea for an article, was thinking about that myself. I’d love to see the video you’ve found if you can reply and paste in the link. I know we’ll have to deal with the fluid in the Transmission Cooler lines/radiator as well, and put back the right amount and type of fluid. I congratulate you on your excellent, informative articles. I follow them all. I own a meteorite silver 2008 DB9 which I love. She is now at 32000 miles. I’ve been using a Garmin Bluetooth GPS (there are several) to avoid having to deal with the DB9’s poor phone display and lousy GPS. It has the enviro module that plugs into the OBDII port and displays additional engine graphs and fuel economy as you drive. It also allows you to read and clear fault codes. I changed all of the fluids when I bought the car two years ago. The biggest expense has been a $5000 four wheel brake job. I’d like to ask you if you have any idea how to replace the bulbs in the steering wheel phone control buttons? Hi John. Thanks for the kudos. The Volvo GPS is crap. Love that your Garmin has the module to plug in and give you more data. I presume you retrofitted the Garmin over the original GPS somehow. I am just about to start the filming on a full brake job, next time you should be able to do it for about $2k. Can’t say I have any idea how to update the lights on the phone control buttons, I don’t have those in my car (no Bluetooth). I know that the phone control button module is an add on. Worst case you replace the module from someplace list AstonMartinBits.com. Not sure if its a bulb, or LED. If LED, then unlikely burned out, more likely something like a bad ground to the module or similar. Anyways, sorry can’t be much more help. Ive always wanted an Aston Martin and after reviewing your blogs, watching all your videos in October of this year I pulled the trigger and bough a 13444k miles 2005 DB9. I wont flood this post with random comment as you worked so hard to keep things in perspective so I will get to my idea regarding coil packs. I am about to do the same process and replace all 12 plugs etc, and what I wanted to know before-hand was the measurements on the boot of the coil pack. I am wondering if Ford used the same pack in the trucks, Volvo, or XK-R or RS Jaguar since so much is share from these parts bins already. What I wanted to do was see if I can find the same style in one of the other and see if the measurement of the boot is same or even check the ford models that had the inline 6 motor in it that the Aston was based off of an see if that coil pack is the same length. I will start order my parts based on what I find but will go to my local Aston of Dallas for the gaskets as the plugs are no brainer online NGK V power series. Thanks in advanced and I hope to get to chat more as I have made some fun discoveries and created some videos as well, such as what I found out about our tail lights and how I fixed it. Congrats on getting one! Would love it if you share what you discover on your journey. I don’t have the old coil packs anymore, I should have looked into that further before I tossed them. You could always buy just one Aston Coil pack from your local dealer and then do some research. If you strike out, then buy the other 11 :>). I just did my 2yr service over the holidays and have an AMOC track day in 2 weeks, looking forward to using the loud pedal without worrying about tickets. 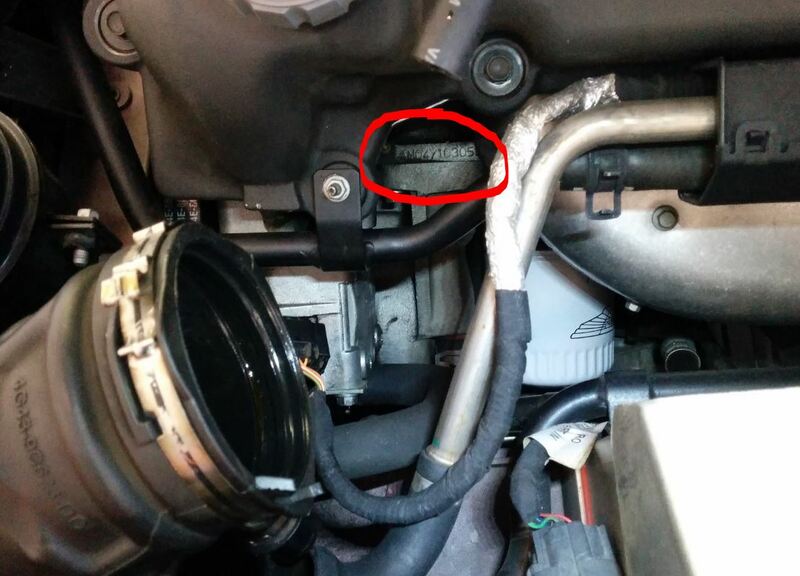 In the example you posted on your blog, the Lincoln LS coil pack was for the V6 Lincoln not the V8. As I mentioned prior if you can provide me the dimension of the boot I would like to compare it to the V8 Lincoln LS which is longer but not sure how close yet. I’d be nervous about subbing out the coil pack without having some electrical specs that would confirm the electronics are the same. I wasn’t able to find diddly squat about the OEM coil packs in this regard. How about you? 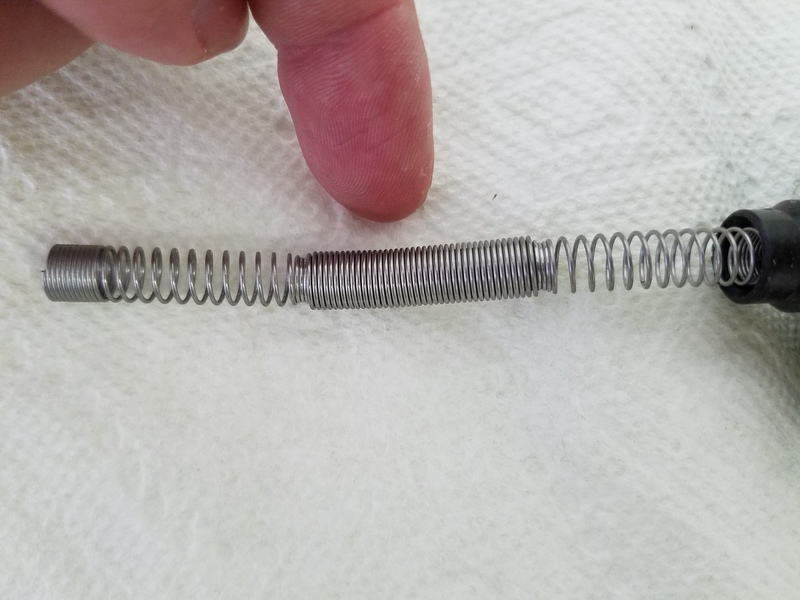 The spring unscrews from the coil. I used Jag 3.0 coil packs on my 2005 DB9 and swapped the original boots and coils. I wouldn’t recommend this on a high mileage DB9 but mine had 20,000 miles when serviced. The boots are a wear item too so you do run the risk of misfires if the rubber has been compromised. Thanks for this tip! 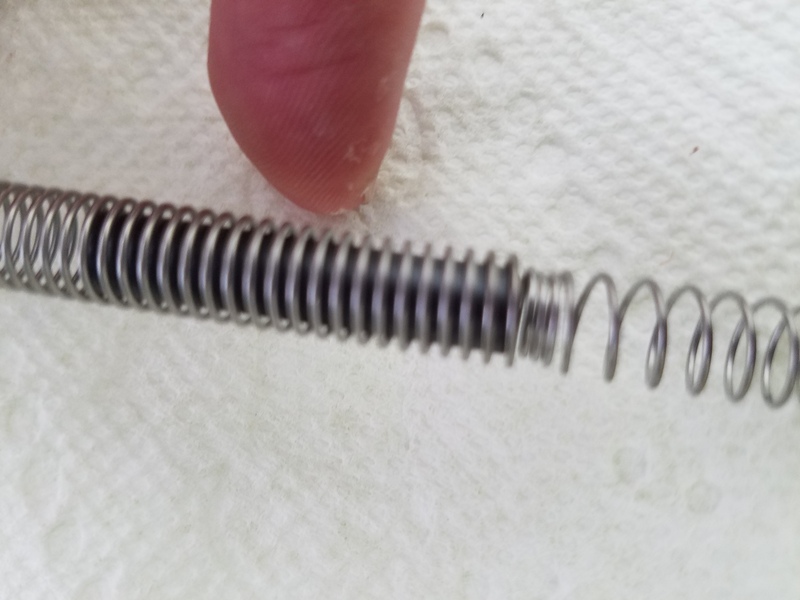 I didn’t try unscrewing the spring, I presume you mean to just unthread the actual spring. If the boot was in good condition, I suspect it would be OK to reuse. I am learning more about the Coil Packs chatting with some of the original AM design team, and may have more to add soon.